To most people, Italy does not immediately come to mind when one thinks about great eighteen-century (Settecento) European art. By now there remained few traces of its Renaissance greatness. Venice still produced important art; those internationally known, like GiovanBattista Tiepolo, Francesco Guardi, or Bernardo Bellotto were invariably making their names outside their homeland or working for a foreign market. Among the Italian masters of the period who are now less known, was one who, inadvertently or otherwise, captured a lucrative niche market represented by the latifondisti English nobility and the Anglo-Irish such as the brewer Joseph Leeson, who, elevated to what cynical 19th. century members of the House of Lords would call the Beerage, became Earl of Milltown in County Dublin. It became de-rigueur, when passing through Rome during the Grand Tour, to have ones portrait painted by the Lucca painter, Pompeo Batoni. His style, which became extremely popular, was to depict the nobleman against a background of Roman ruins, classical landscapes and fragments of ancient Roman statues had, in the process, a great influence on subsequent English portrait artists, the landscaped gardens Capability Jones created and painters of the Enlightenment. Before making his name and, not less important, his fortune painting portraits Batoni was attracted to mythological allegories subjects and, having the good luck to share Rome with the headquarters of the Church, a steady income represented by religious paintings. Batoni was an artist who took religious paintings seriously and charged a premium on them, compared to his portraits. 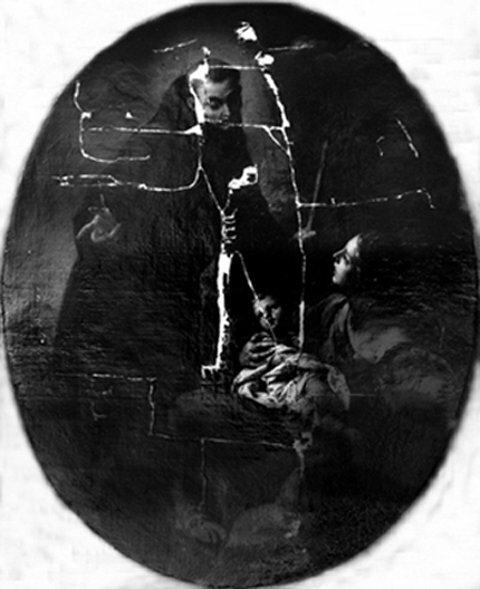 A good example of the delicate style he adopted in his smaller religious paintings is our desperately damaged "The Holy Family with St. Anthony". Over time, old paintings on canvas become weak and brittle and need relining, that is, a conservator attaches a new support canvas to the back of the original. Nevertheless, even it, with the passage of time will wear thin and no longer support the painting. With our Batoni, this is what happened. When the oval painting under tension, set within a heavy gilt and elaborately carved timber frame, aided by the force of gravity fell from the wall, the canvas literally exploded. It was more luck than design that the painting’s owner was able to recover most of the scattered canvas fragments at the time of the disaster. This type of calamity occurs more frequently in private collections. The owner attaches the framed painting to a hook in the wall using copper wire or, even, string. These inevitably rust or wear thin. Frequently, also, they fail to fix the hook itself securely into the wall. This is unlikely to happen in public collections or museums. There, the framed paintings are attached directly to the wall, or hang from specially designed rods. This type of rail for hanging pictures, an adjustable rod that is hooked to an angle bracket running horizontally along the top of the wall is a simple and effective system. Known as, ‘Cimaises pour accrochage des tableaux’ they are inexpensive and available in larger art supply and DIY stores. As the metal wire that supported our lovely Batoni yielded to rust and the weight of the heavy gold frame, it received a final coup de grace when the canvas fell directly onto a small bronze statue beneath, puncturing the canvas. 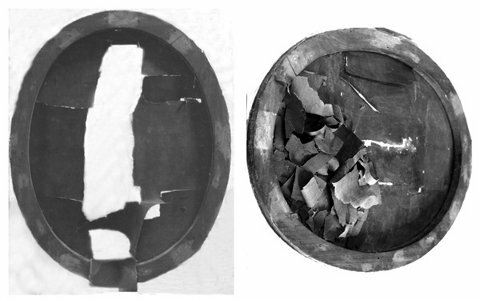 "Because of the high tension to which the stretched canvas had been subject, the violent impact completely detached fragments of canvas with of the head of St. Anthony and the Child Jesus; many other pieces were still held on to the original canvas by a slender thread. An ancient inscription on the back of the oval stretcher (frame) revealed that restorers had attached a subsequent canvas, known as a relining, on to the original painting in the mid-nineteenth century. The damages appeared so severe and final the owners of the painting insisted that any attempt to salvage the painting was a lost cause." Although Batoni’s "The Holy Family with St. Anthony" suffered serious laceration with many fragments missing, the surrounding canvas remained attached to its wooden stretcher. The delicate surgical operation to replace the missing pieces the bronze statue had punched out became a real puzzle for the conservators. 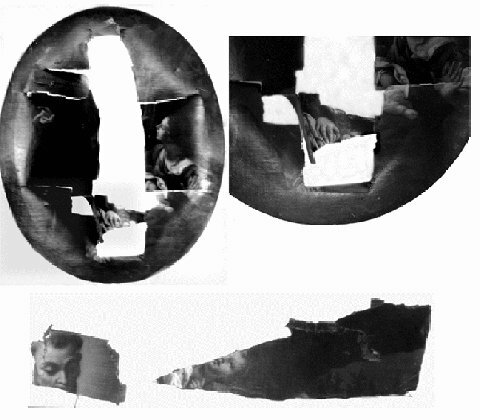 The painting was placed on an oval padded support to protect the surface and the conservators inserted, temporarily, the fragments of painted canvas into their original places on the painting. Turning over the canvas and, using sharp scalpels, they removed, thread by thread, the delicate and worn relined canvas. However, as the painting had originally been stretched and nailed tight on to its stretcher and was held under tension, the damage caused by the bursting canvas and the relaxation of the fabric left gaps in the areas where the paint fragments were inserted. The slight change of size of the various pieces of canvas meant that not all the fragments were able to come together in a perfect fit. “In areas where the original pieces of canvas were joined up, showing that cracks had formed between the neighbouring colours, stucco was added; the filling was then levelled gently with a surgical scalpel, in preparation for the replacement of the lost original”. The conservation experts used layers of fine synthetic tissue to reinforce the back of the original canvas and the rescued paint fragments. This operation prevented an undesirable tension arising during the operation of adding a new canvas to the back. When finished, the painted surface had assumed a discrete stability, allowing the technicians to remove the protective tissue layer previously covering it. Using copper tacks, they stretched and nailed the resurrected Pompeo Batoni back onto its original stretcher. Their next operation was to clean the thin and fragile painting itself. For decades, the beauty of the original colours remained hidden underneath layers of thick gloomy varnish. The cleaning of the delicate surface of a painting is a painstaking process and requires the utmost skill by the professional restorer. He or she should be able to choose the cleaning technique best suited for a particular art period, school or individual painting. Some artists of the Seicento (17th. century) like the Neapolitan, Mattia Preti or the Flemish genre artists, David Teniers and Adrian Brouwer used specific painting techniques that are easily damaged during cleaning by the incautious use of chemical solvents. After cleaning, the restorers inpainted and harmonized with the neighbouring original colours those parts of the painting that had been lost. As the "Holy Family with St. Anthony," resurrection wound down, the painting’s subtle and brush strokes revealed Pompeo Batoni’s debt to Carlo Maratta. His colours give you a glimpse of Rococo elegance that you find in his "Return of the Prodigal Son", painted in 1773 for the Vienna Royal court and now in the city’s Kunsthistorisches Museum. Batoni’s technique is that of the classical painters of earlier generations like Raphael and Guido Reni. He was sensitive to the emerging influence of the neo-classical style in contemporary art circles but avoided the cold academic finish that you find in the canvases of his contemporaries, Anton Raphael Mengs and Jacques Louis David. In a restoration that successfully saved a little masterpiece, we now see how the artist’s use of red in the Virgin’s mantle shows the late Baroque influence of Carlo Maratta, a Roman artist of a slightly earlier generation. You can spot it in the painting’s diagonal arabesque design formed by the movement of the Madonna embracing the figure of Jesus and its conclusion in the venerating figure of Saint Anthony. 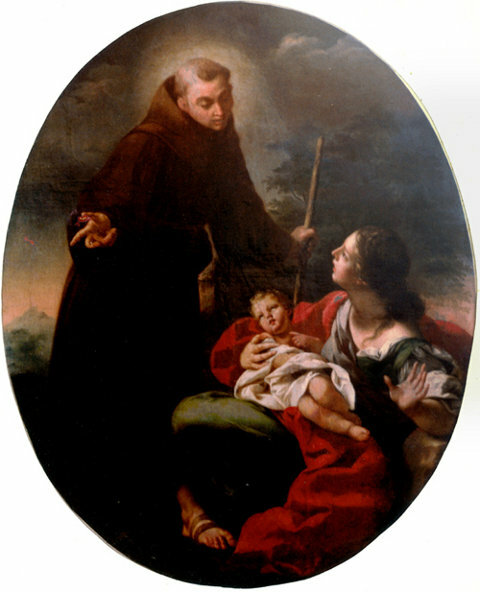 Carlo Maratta’s spirituality is echoed in "The Holy Family with St. Anthony" and shows Pompeo Batoni as the natural heir and successor of the classical Roman style of the '700.